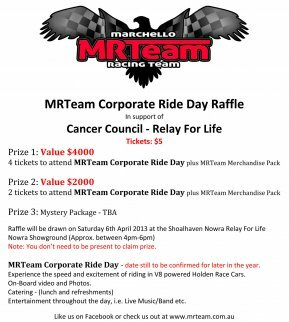 For 2013 MRTeam will be supporting the Shoalhaven-Nowra Relay For Life. We will be attending the Relay with both Race Cars and the Transporter on display which we know will be a great attraction for the event. To help raise funds for this great Charity we're holding our own raffle with some Adrenaline... Read more. Written by Chris Dobie – SouthernDrive.com.au SHOALHAVEN motor racing outfit MRTeam have proven they are serious about their future in the sport with an impressive debut appearance at the world famous Mount Panorama... Read more. MRTeam travelled to Sydney Olympic Park for the 2012 Armor All Auto Show at Sydney Telstra 500 V8 Supercars from Friday November 30 to Sunday December 2. Raceline Events have been involved with this awesome event for 4... Read more. On Friday 23 November MRTeam Accompanied the Today - Weather Segment at Sydney Motorsport Park for the 'Celebrating Motor Racing History - TASMAN REVIVAL'. With an early start planned for the morning show MRTeam drove up... Read more. MRTeam enjoyed a very exciting and eventful weekend on November 3/4 at Goulburn’s Wakefield Park Raceway for Round 6 of the NSW Motor Race Championship. Qualifying was smooth and organised. Drivers Ryan and Reece... Read more. MRTeam was proud to be a sponsor of Sutherland Local Area Command’s 2nd annual ‘Sutho Cops & Rodders Road Safety & Car Show’. The educational festival was held at Boys’ Town Playing Fields, Woronora Rd, Engadine on... Read more. Saturday 6th October represented a first for MRTeam when we hosted a Network Function with members of the Milton Ulladulla Rotary Club and Milton Ulladulla Business Chamber, as well as MRTeam Sponsors & Supporters. We were... Read more. MRTeam was honoured to participate in Ignite The Plaza on Friday 5th October. Ignite The Plaza is a Milton/Ulladulla Rotary HarbourFeast event which was held in conjunction with the 2012 EscapeArtFest. The MRTeam custom... Read more.